At McArthur & Boedeker, Attorneys at Law, in Cleburne, Texas, we offer unmatched advocacy and support in a variety of legal areas to help you and your family with some of the most serious and sensitive legal challenges you may ever face. We understand that you have a lot of choices when it comes to legal counsel; however, by working with our law firm, you can expect to receive highly personalized representation from a local attorney you can trust. Personable and compassionate, we promise to provide the straightforward advice you need to make the best informed decisions about the matters that affect your case, and we will always remain accessible to address your questions and concerns as they arise while providing regular updates as to the status of your case. 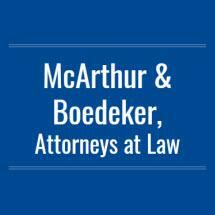 For more information on how McArthur & Boedeker, Attorneys at Law, can best serve you and your family in your time of need to help you secure a brighter future, we invite you to contact our law office to receive a free initial consultation.